6 wild and brilliant painted mild Customs, all painted by legendary Custom Painter Larry Watson. Lined up for this Watson Line-Up Photo shoot. This amazing line up photo of 6 Larry Watson outline or panel painted Custom Cars was most likely organized for a magazine photo shoot. Several photo taken during this photo shoot have appear in various magazines including the 1961 Custom Cars Annual the Popular Customs Winter 1963 issue. The photo was taken most likely in 1959, perhaps late 1959. Possibly it was George Barris who took the photos. 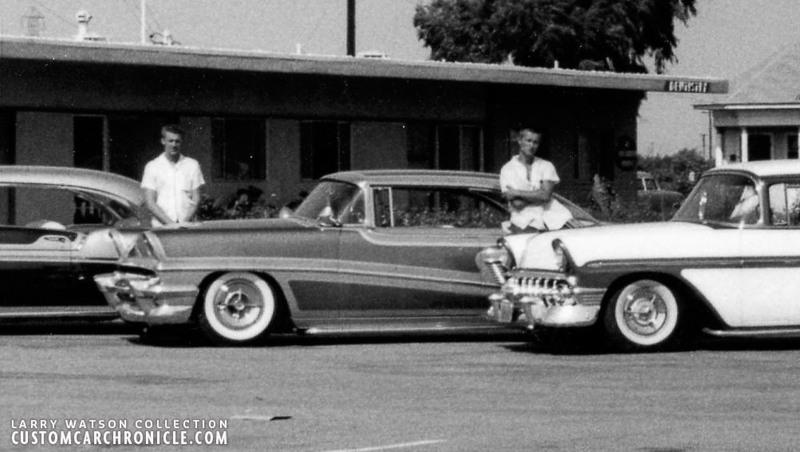 The photo, including several close up’s of Larry with his ’58 T-Bird taken at this location appeared in the Barris Kustom Techniques of the 50’s Volume 4 book. The location, which so far I have not been able to identify was used for this, but also for several other photo shoots of Larry Watson painted cars. Most likely it was in the neighborhood where Larry had his shop in 1959, Rosecrans Blvd in Bellflower Ca. If anybody recognizes this location, please let us know. The cars that were picked for this photo-shoot are (from left to right) John Busman’s 1956 Chevy, Unknown owner 1956 Mercury, Unknown owner 1956 Chevy, Jim Doss 1958 Chevy, Bob Mayfield 1959 Chevy, and Larry Watson 1958 Thunderbird. It must have been really fantastic for Larry Watson to see this line up of beautiful painted Custom Cars he had created. So colorful with outlines and panels enhancing the body contours and lines of the cars. Larry was still in the beginning of his long career, but the Rosecrans Blvd shop had already turned out a huge number of trend setting paint-jobs that had put Larry at the top of the field. By looking at this Line-Up photo you can see that everything was well directed. With the guys all standing next to their cars. The cars are parked in such a way that most of them show up in the picture. The colors of the cars were evenly spread to make sure the contrast between the next car was as large as possible, making it work best for both color fill as well as black and white photography. And this last thing makes me wonder if this shot was also made on color film, since there are individual photos of most of the cars in this photo-shoot taken at this location in full color! 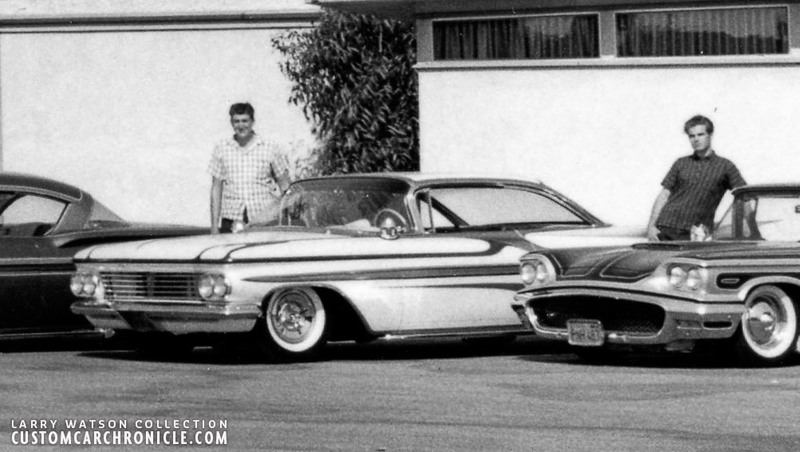 Lets take a closer look at the cars in this special All Larry Watson painted Custom Car Line-Up photo-shoot from 1959. 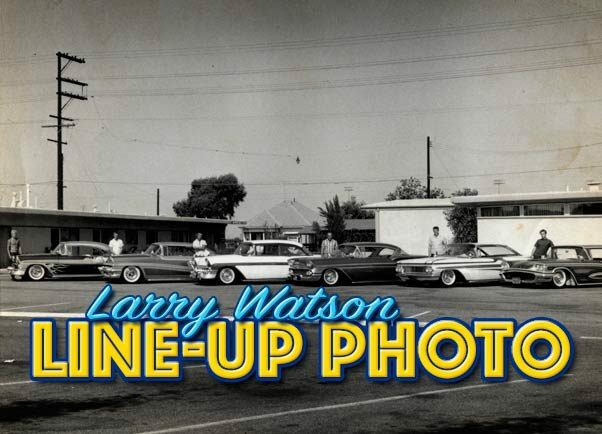 The Larry Watson painted Custom Car Line-Up photo from around 1959. Photo from the Larry Watson Personal Collection, original possibly taken by George Barris. 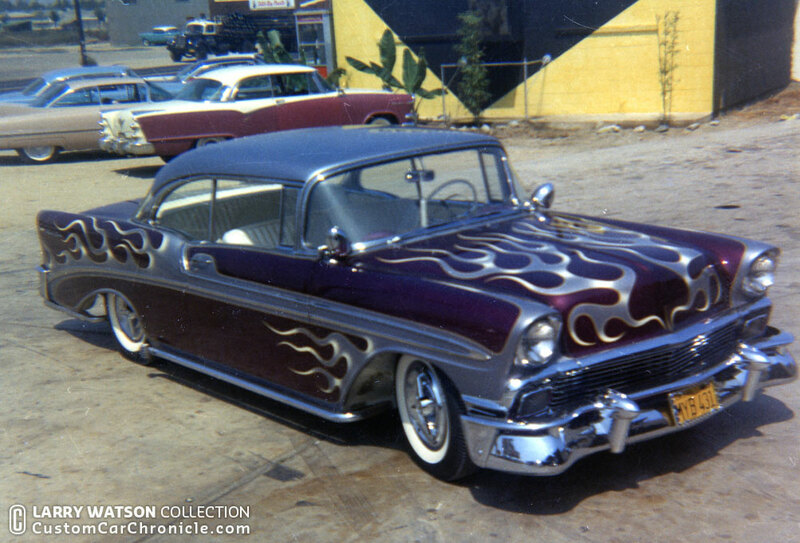 John Busman was a good friend of Larry and Larry painted John’s 1956 Chevy several times. Shown in this photo the car was painted in candy purple and silver. This version of the car shows a brilliant combination of several styled blending into one cars paint-job. Larry combined his famous outlines with scallops and flames into one beautiful design. The silver outlines enhance all the body lines of the car, and make the body look slimmer. The fine silver painted flames were highlighted in pearl white to give them a 3D effect. The car was mildly restyled with shaved hood and trunk, lowered with white wall tires, Spotlights, Lakes pipes, as well as Bellflower tips at the back and Lancer Hubcaps. Close up from the Line Up photo of John Busman’s 1956 Chevy. Printed color photo from the Popular Customs winter 1963 issue show John’s Chevy photographed at the same location as the Line-Up photo. The all white tuck & roll interior looks stunning. 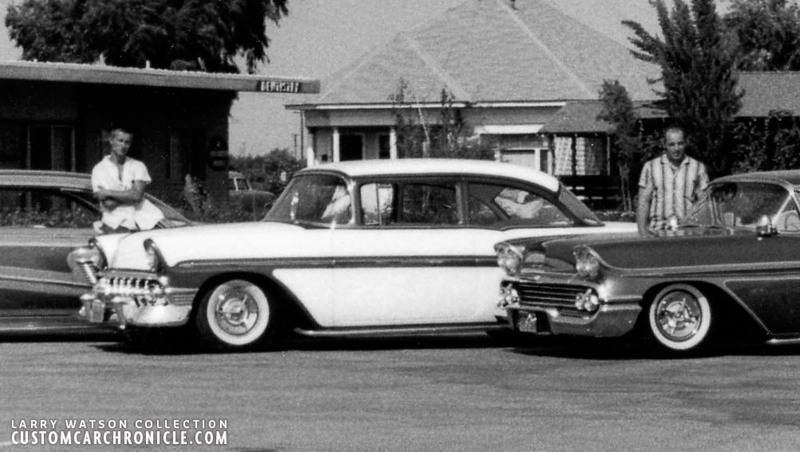 Another photo of John’s Chevy comes from the Larry Watson Collection and was taken at Larry’s Rosecrans Blvd Shop. It gives a better look at the paint colors. Notice that the body was only mildly shaved, the door handles remained on the car, and Larry even accentuated them with outlining them with paint. 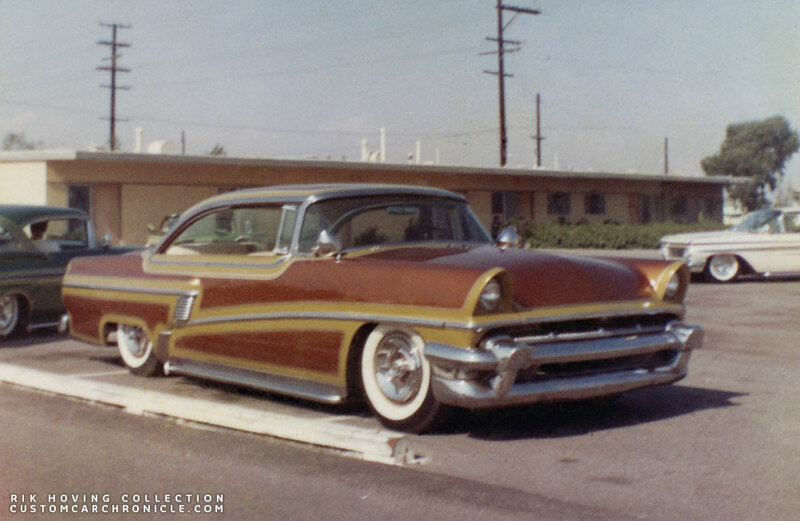 Unidentified smoothed ’56 Mercury with lowered suspension, lakes pipes and Bellflower tips and Dodge four bar lancer hubcaps with painted root beer centers. Larry Painted the body in a lime gold with wonderful candy root beer panels. Larry created a much larger outline around the body main character lines than he usually did and outlined this in another gold outline. The spotlights and a full white tuck&roll interior make this car a wonderful sample of late 1950’s customizing. The unknown owner of the car is standing behind the Merc on the left side of the photo. Anybody knows who he is? A beautiful color slide was made of the Mercury during the photo-shoot. This very sharp photo shows the Mercury in all its beauty. 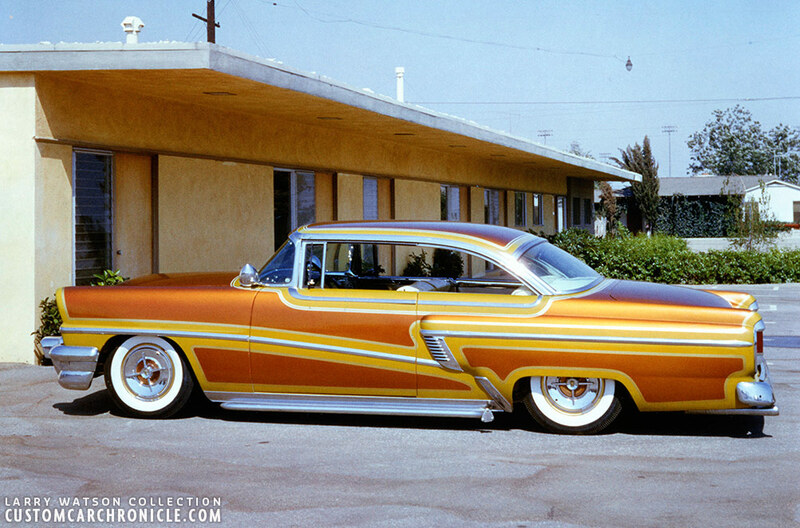 The Mercury was still a mild Custom, although it had some more work done than John’s Chevy next to it. All the emblems and handles were shaved of the car, combines with the outline paint job and Larry’s excellent eye for design the car looks so much longer than when it had been painted in just one color. This snapshot is from my own collection and its very interesting, not only because it shows the Merc from a different angle, but it also hows Jim Doss’s ’58Chevy and Bob Mayfield’s ’59 Chevy in the background at the location. Not sure who took this photo, but more than likely one of the car owners, or possibly a friend that joined them to the photo-shoot. 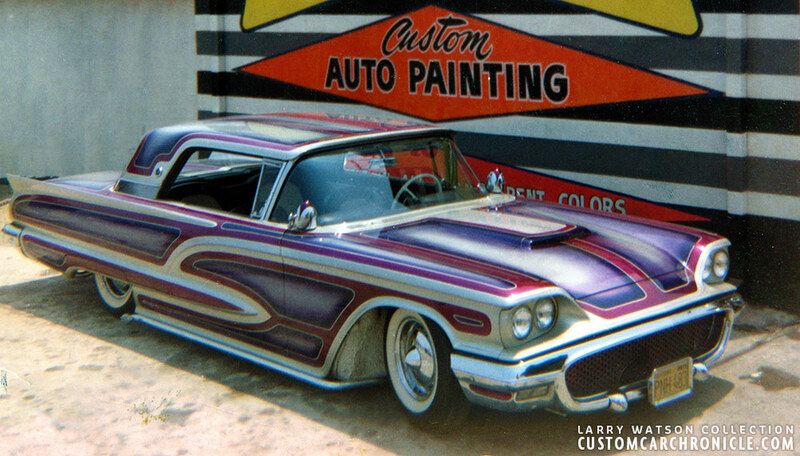 Many of the cars Larry painted in his career are sadly unidentified. They came to the shop, Larry painted them and the next day they were gone. Same thing happened with this great looking 1956 Chevy Sedan in white and candy teal-green outlines pinstriped in gold. The scallop on the trunk shows how genius Larry was. Hiding the trunk lock in the end of the scallop. 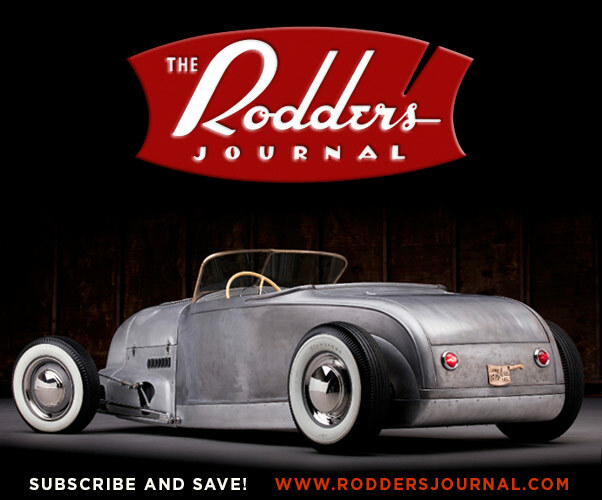 Before Larry got to work on this one, the Chevy was mildly restyled with an ’53 Chevy grille with added teeth, removal of all emblems and door handles for an super smooth look, Lowered suspension, lakes pipes, three bar spinner hubcaps and Custom lenses on the taillights. One very smooth Sedan. The unknown owner posing behind the Chevy on the far left of the photo. 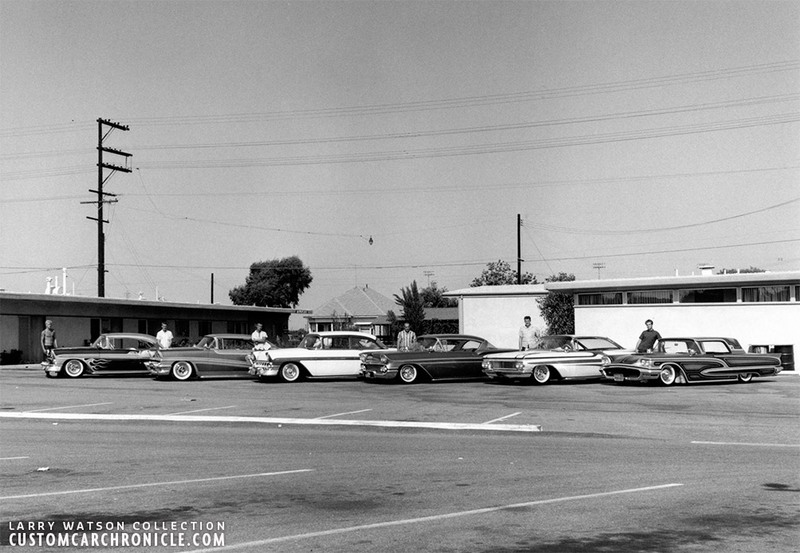 Snapshot from my personal collection shows the Chevy with the ’55 Merc and Jim Doss’s ’58 Chevy parked next to it at the Line-Up photo location. The addition of the older ’53 Chevy grille (or ’54 units) was a very popular option for ’56 Chevy’s. 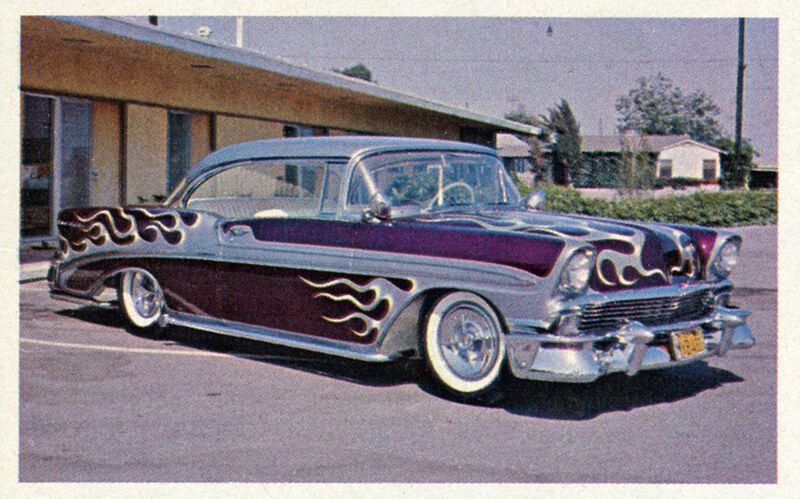 This photo of the unidentified Chevy taken at Larry Watson’s Rosecrans Blvd shop shows the brilliant design of the outlines on this car. The way Larry designed the layout the car’s body looks almost sectioned. 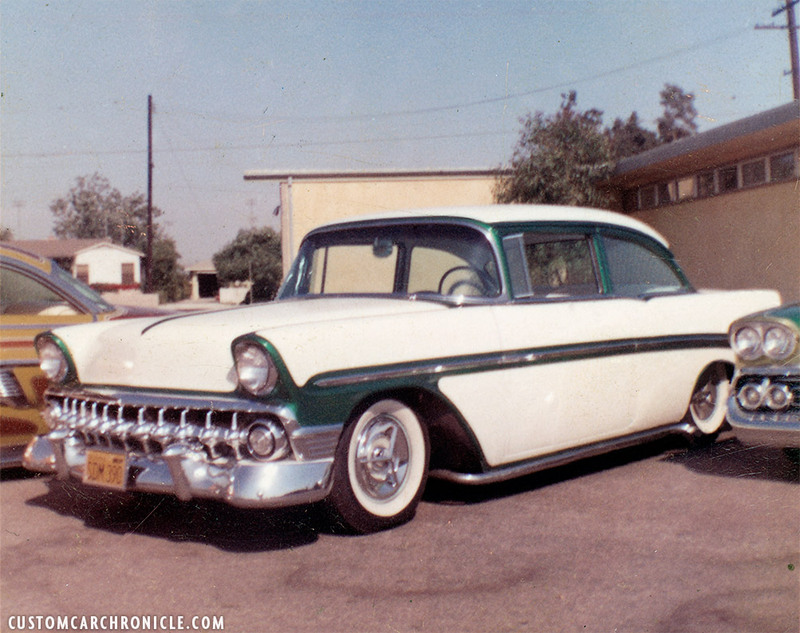 The ’58 Chevy in the Line-Up photo belongs to Jim Doss of Bakersfield, Ca. The car had been shaved of all its handles and trim including the fake rear quarter scoops. The front bulbous portion of the side trim was replacing with the rear portion. This gives an elegant feel to the side of the body that you really wonder why they had not thought about that at the factory. The rocker panel trim was also removed and to help lowering the body a set of lakes pipes was installed. At the back the taillight were replaced with a taillight unit from a 1959 Pontiac Catalina. The roof scoop was modified with the chrome trim removal and the addition of a small peek to the leading edge. The car was lowered and four bar lancers hubcaps were installed on perfect size white wall tires. All body work was performed by Walker’s Body Shop from Bakersfield Ca. – the home town of Jim Doss. Larry painted the car in candy green with lime gold outlines pinstriped in white. 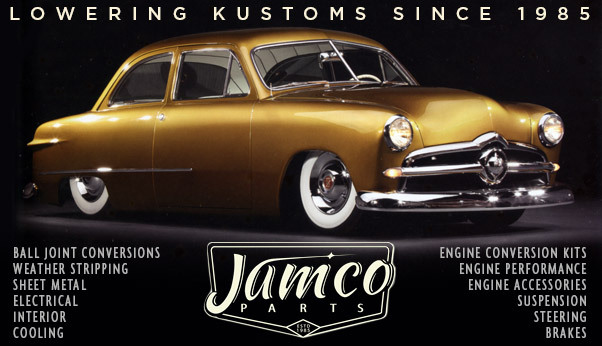 Jim’s car has been published a lot over the years, and is still one of the most recognizable and well known outline painted cars from Larry Watson. 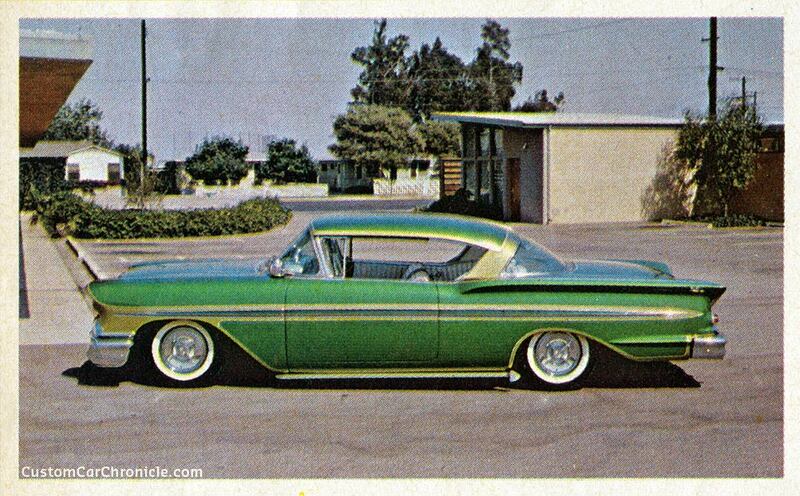 Jim Doss in vertical striped shirt posing next to his deep candy green and lime gold ’58 Chevy. Published photo from the Popular Customs Winter 1963 issue shows the car at the same photo location as the Line-Up photo shoot. 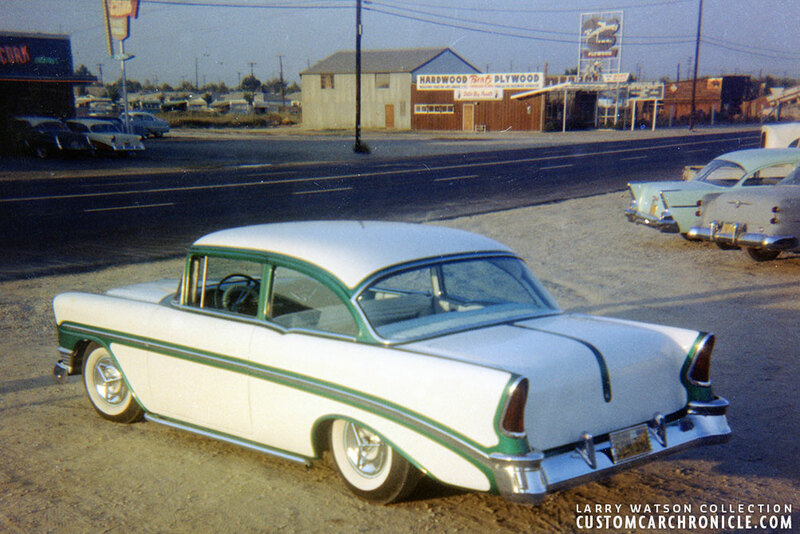 This photo of Jim Doss’s ’58 Chevy taken at the Rosecrans Blvd. Watson Shop shows how gorgeous the car is with the super slick outline paint job in candy green and lime gold. 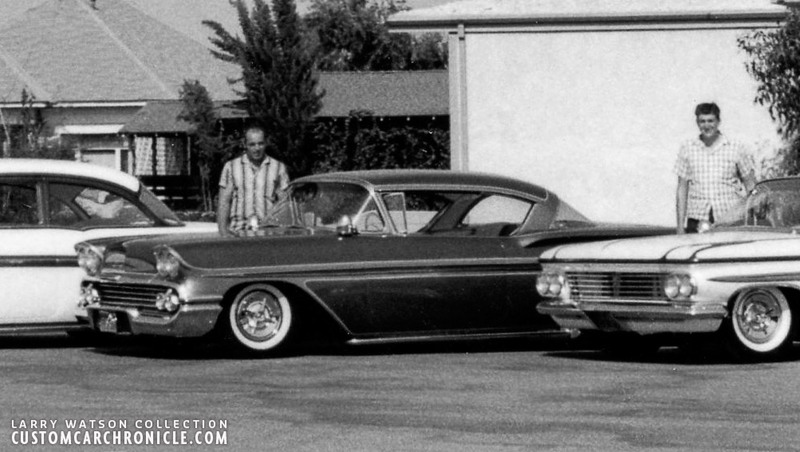 Bob’s 1959 Chevrolet Impala was just as Jim Doss’s ’58 Chevy restyled by Walker’s Custom Shop in Bakersfield. Bob Mayfield also lived in Bakersfield, California. Bob’s Chevy had perhaps the most actual body work done to it from all the cars in the Line Up photo. The hood “eye-brows” were filled-in while extending the hood. All emblems as well as the door handles were shaved. The taillights were removed, new shaped metal added and two ’59 Cadillac taillights added on both sides, into custom made pods. The stock grille was replaced with an tube grille, very popular on mild customs at the time. A set of spotlights and side pipes were installed and the car was lowered by cutting the coils wide whites were added with Dodge Lancer four bar hubcaps with gold center on gold painted wheels. 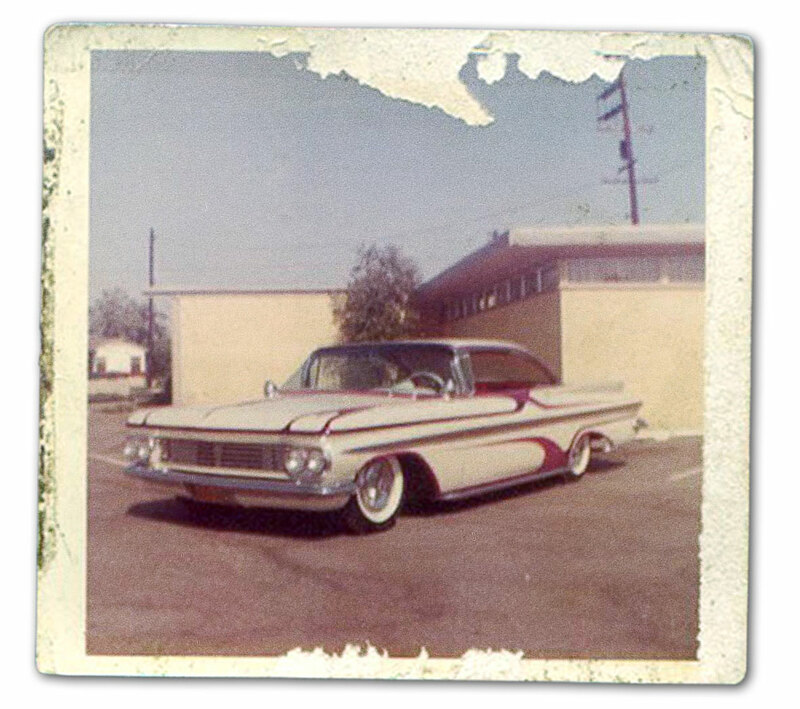 With the body work completed Bob drove the car to Larry Watson’s Rosecrans Blvd shop for a Pearl white paint job with flowing scallops in lavender and purple pinstriped in gold. Bob Mayfield with his checkered shirt behind his Chevy. 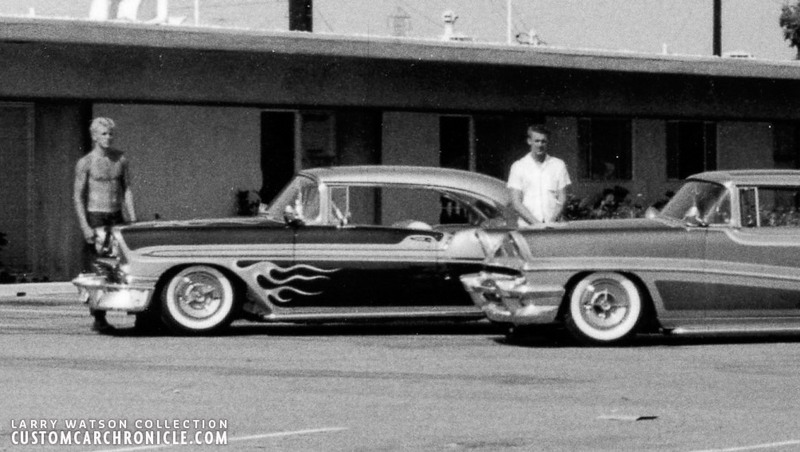 Snapshot of Bob’s ’59 Chevy at the Line-Up photo location. The paint style on Bob’s Chevy it totally different from all the other cars in the Line-Up. Very light, and elegant with a lot of “motion”. The last car of the line up, all the way to the right is Larry Watson’s personal car, his ’58 Thunderbird. Shown in this photo is the second outline, or panel paint job on the car. 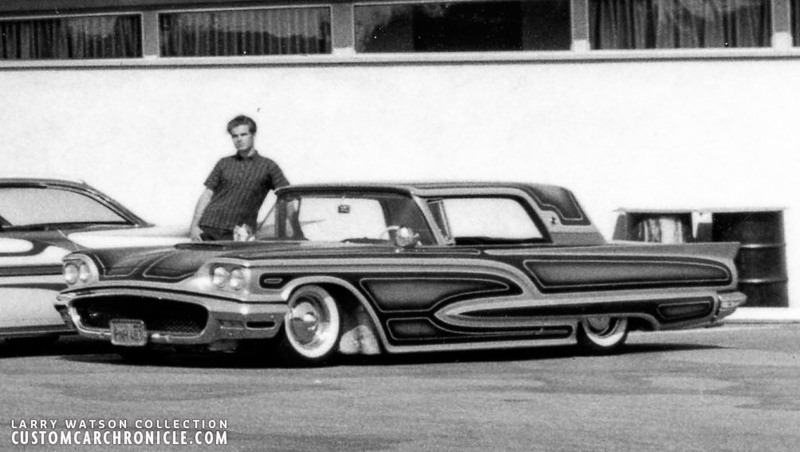 In 1958 Larry bought his car brand new and drove it to be lowered at Lindy’s Muffler Shop, then next it went to Barris where Bill Hines shaved the door handles and ornaments. Bill DeCarr nosed and decked the car. Then Larry painted the car in the brightest silver platinum pearl. The ultra bright paint made the lowered car look to bolt, and it was way to bright. So Larry figured he could outlined all the body contours and then added Candy Burgundy over the pearl silver. The candy paint looked absolutely amazing, and the effect was just what the car needed. The car looked a lot thinner with the new paint job, and the thin lines of pearl silver accenting the body lines added an extra custom touch to the car. It was almost like doing Custom Restyling, but then with nothing more than paint. Larry pin-striped the candy burgundy panels in lavender, which slightly softened the hard edge between the silver and burgundy. 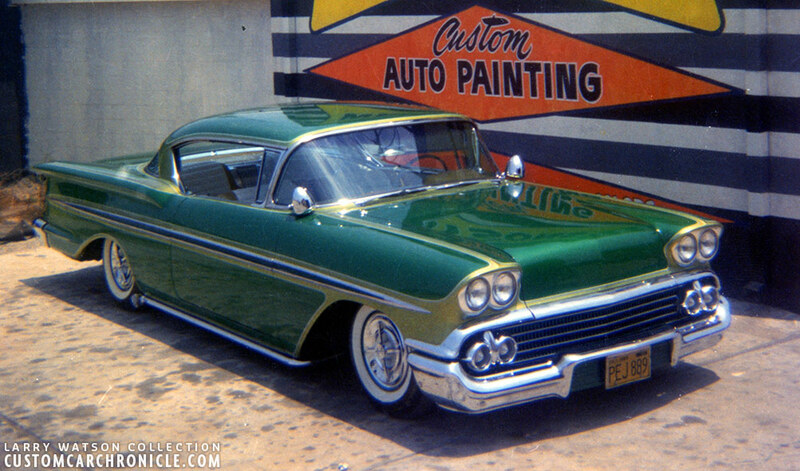 The custom paint that was available back in the later part of the 1950’s and early 1960’s was very bright, colorful, and the hues very brilliant, but most of these products were experimental and not tested very good. In fact Larry helped develop a lot of new custom paint products, and was testing material for his suppliers. It turned out that a lot of these early custom paints started to fade or crack after just a few month in the sun. This also happened with Larry’s ’58 T-Bird, so after half a year the Candy Burgundy had faded so badly, that he really needed to re-paint the whole car. But he thought about it and decided to add some more panels on top of the faded paint. He taped of the panels with 2 inch tape, and sanded the inside as smooth as he could, then added a fine silver base. Then taped off the outside half inch and fogged in candy grape. When he removed the tape the new panels had a 2 inch burgundy border (from the original paint job), then an half inch silver outline and the main panel was candy grape fogged over the silver. The paint job looked stunning and it brought Larry a lot of new customers who wanted a similar paint job on their cars. This is the version of the car that shows in the Line-Up photo. Proud Larry Watson posting with his “Vino Paisano” 1958 Thunderbird. 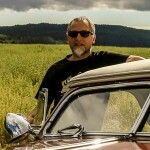 Close up of Larry with his ’58 T-Bird at the Photo-Shoot location. The color photo on the right, from a 80’s Hot Rod magazine publication, shows Larry’s car in color at the photo location. And here is a photo, to show off the colors a bit better, taken at the Rosecrans Blvd. Watson Shop. Can you imagine to drive by this location at the time this photo-shoot was going one, seeing all the wild brilliant colorful Customs outside in the sun gathered together at this parking lot. Or having to stop at a stoplight seeing these cars just leaving the scene, in a convoy back to Larry’s place, or up to the drive in for some local cruising. The Jim Doss 58 Chevy is my favorite mild custom ever. Such a classy Watson paint scheme with the candy green and gold colors. I love green cars anyway, and this one just speaks to me. Thanks for the article Ric. The 56 Merc is my favorite. Drove one all through High school and for a few years after. Fantastic pictures here! It’s always interesting to see different photos from the same day, same location because they show a new perspective. I have seen the pictures of the ’56 Merc in a book before but this is great to see it as part of this Watson line-up. What I find amazing about Watson’s work is that it is instantly recognizable- at least in my mind. Many painters tried to be similar or even copy his style, but Watson’s original designs and paint work have a certain look all their own.